Martin Brodeur announced his retirement yesterday, ending a remarkable NHL career. 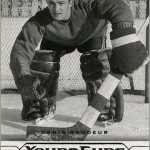 During the past two-plus decades, Brodeur won many awards and set a lot of records. 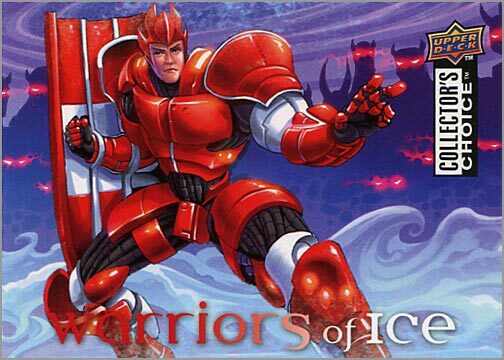 He also had a diverse array of hockey cards over the past 25 years. 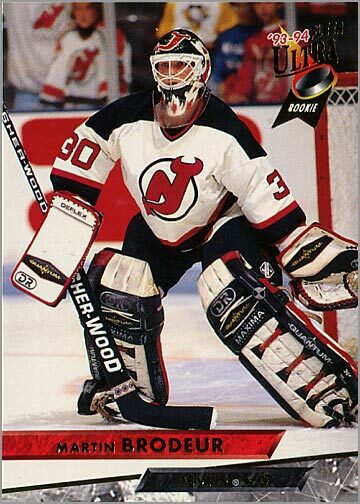 When Brodeur was drafted by the New Jersey Devils in 1990, trading cards were just plain pieces of cardboard. 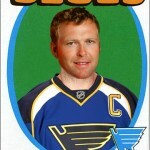 By the time Brodeur’s career ended, cards were as decorated as he was. 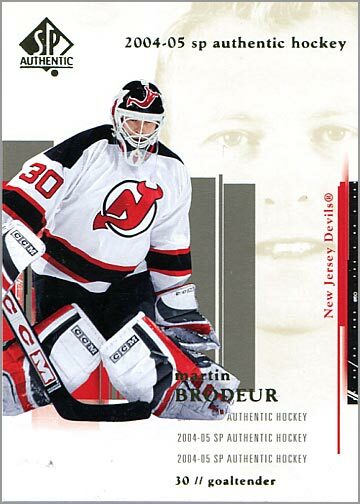 Here’s a look at the past 25 years of Martin Brodeur’s career, illustrated with some of his best hockey cards. 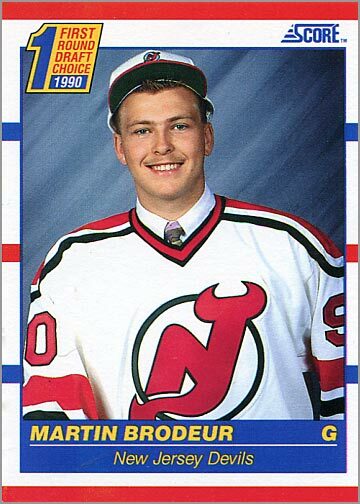 1990-91 Score #439 (Rookie Card) – After being named to the QMJHL All-Rookie Team, Brodeur is drafted 20th overall by the New Jersey Devils. 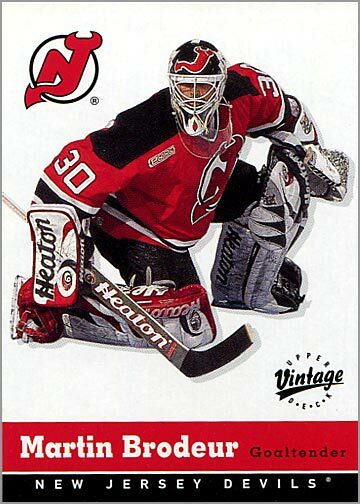 Out of all seven NHL trading card sets issued that year — many with draft pick subsets — only Score bothers to include Brodeur in their set. 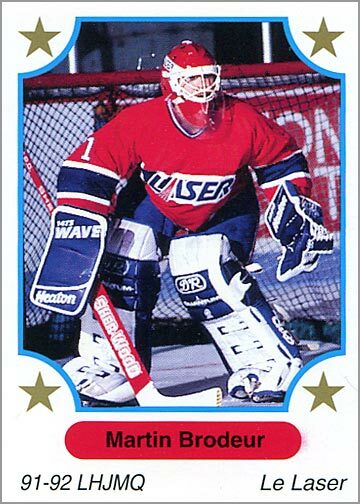 1990-91 7th Inning Sketch QMJHL #222 – Brodeur returns to the Saint-Hyacinthe Laser for a second season of Major Junior hockey in 1990-91. 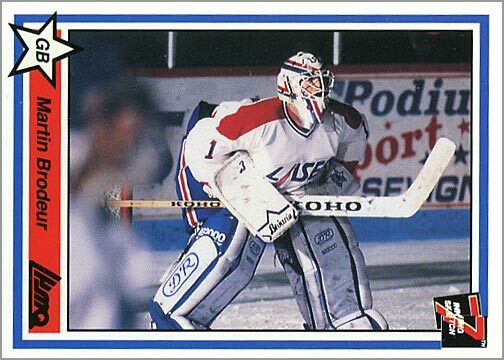 1991-92 7th Inning Sketch QMJHL #1 – Card company 7th Inning Sketch makes Brodeur the first card in their 1991-92 QMJHL trading card set. Brodeur spends his third and final season in the “Q,” earning Second Team All-Star honors. He also plays in four games for the New Jersey Devils. 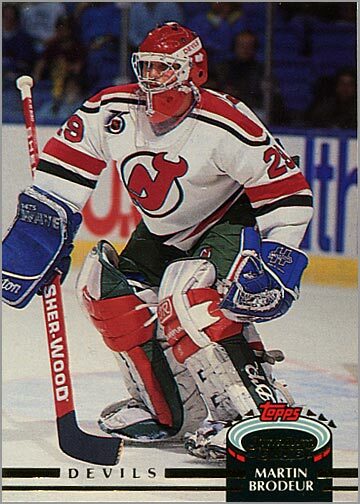 1992-93 Topps Stadium Club #233 – Because of his four games with the Devils the previous season, Brodeur was included in the 1992-93 Topps, O-Pee-Chee, Upper Deck, Score and Stadium Club card sets. However, he’d spend the entire year with the Utica Devils of the AHL. 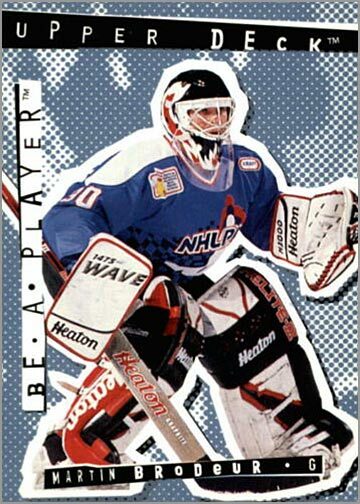 1993-94 Classic Pro Prospects #12 – Brodeur was a part of the Classic Pro Prospects set, which focused on the best minor league and collegiate players from the previous year. 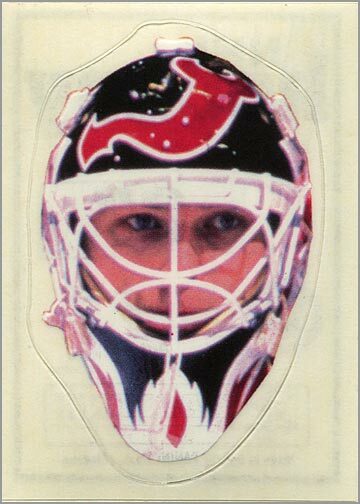 But the closest Marty would get to being in the minors again would be appearing on this trading card that shows him with the Utica Devils. 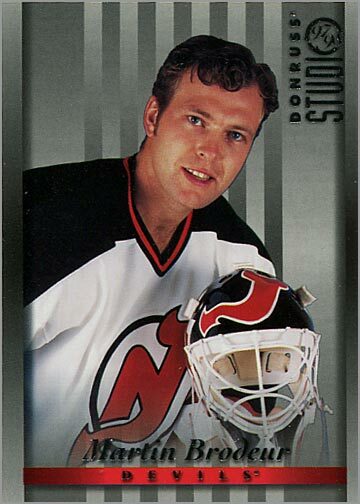 1993-94 Fleer Ultra #357 – And here begins Brodeur’s 20 years with the New Jersey Devils. 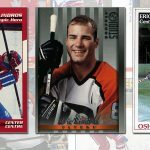 In the 1993-94 season, he was named to the All-Rookie Team and won the Calder Trophy as the NHL Rookie of the Year. 1994-95 Be A Player #R58 – The 1994-95 season was delayed by a 103-day lockout. Brodeur participated in the NHLPA 4-on-4 Challenge as a part of Team Quebec. 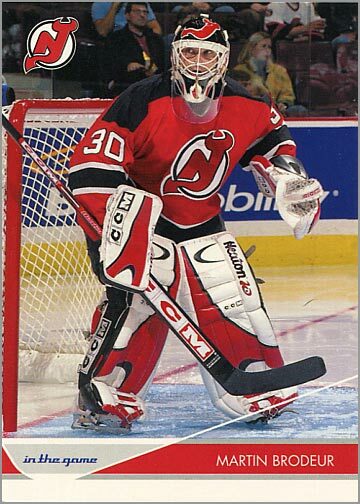 1994-95 McDonald’s #McD-35 – Once the NHL season finally started, Brodeur led the New Jersey Devils to their first Stanley Cup championship. 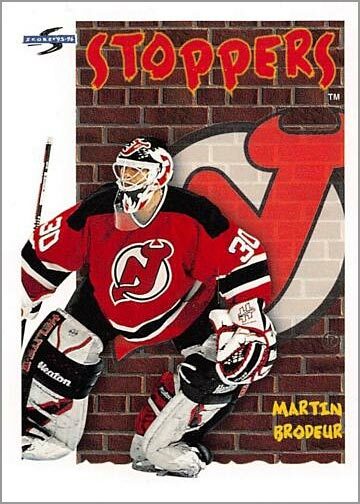 1995-96 Score #323 – Brodeur was named as a starter for the 1996 NHL All-Star Game. 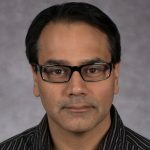 He also won a silver medal with Team Canada in the 1996 World Cup of Hockey. 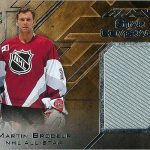 1996-97 Pinnacle #92 – In his fourth NHL season, Brodeur played in the All-Star Game and was named to the Second All-Star Team. He also won the Jennings Trophy for the lowest goals-against average. He even scored a goal against Montreal in the playoffs. 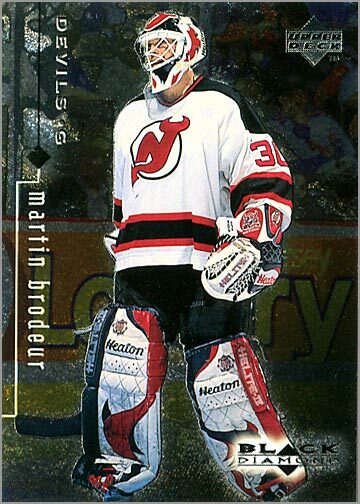 1997-98 Donruss Studio #20 – The 1997-98 season must have seen like a bit of deja vu for Brodeur, who again played in the NHL All-Star Game, was named to the Second All-Star Team and won the Jennings Trophy for a second time. He led the league that year with 43 wins. 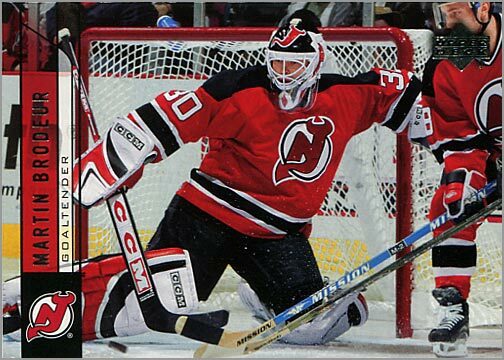 1998-99 Black Diamond #50 – Brodeur would play in his fourth straight NHL All-STar Game. This time, he was a starter for the “North America” team. He also led the NHL with 39 wins. 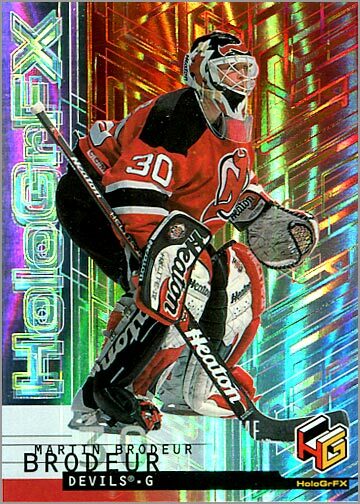 1999-2000 HoloGrFX #33 – Brodeur led the NHL win wins for a third consecutive year with 43, and led the Devils to their second Stanley Cup championship. He also played in his fifth consecutive All-Star Game. Brodeur was credited for scoring his second career goal when a Flyers’ player put the puck in his own net; Brodeur was the last Devils’ player to touch the puck. 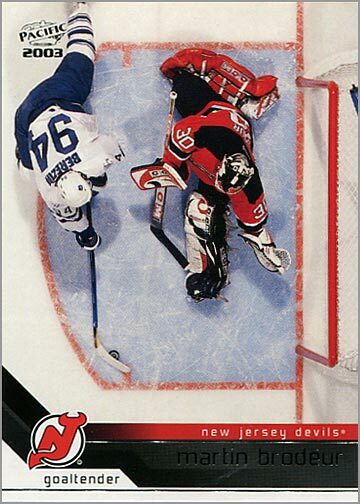 That goal stood as the game-winner, making Brodeur the only goalie in NHL history to score a game-winning goal. 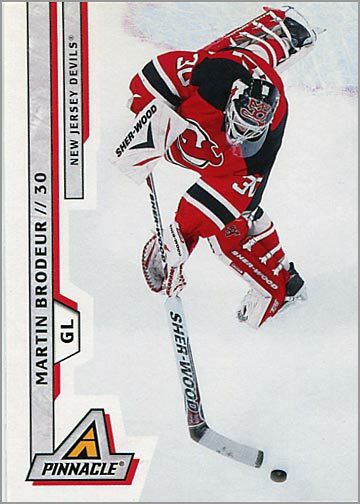 2000-01 Upper Deck Vintage #211 – For the fourth consecutive year, Brodeur led the NHL in wins with 42. He played in his sixth consecutive All-Star Game, too. 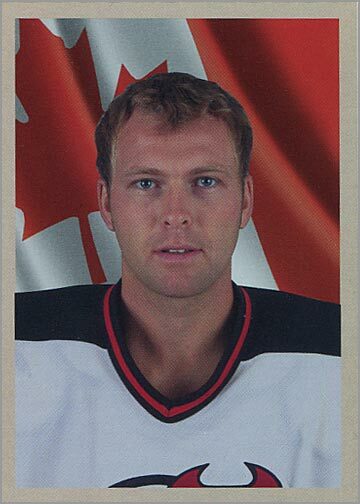 2001-02 Parkhurst Waving the Flag #6 – Brodeur went undefeated in the Winter Games, leading Team Canada to their first Olympic Gold Medal in 50 years. 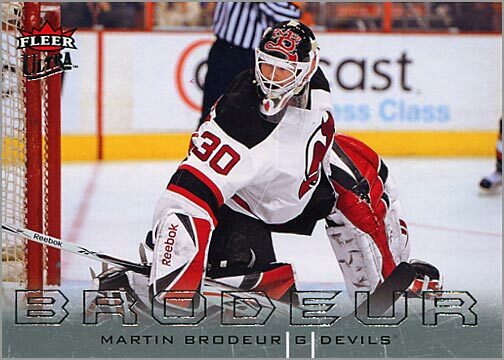 2002-03 Pacific #218 – Brodeur led the league with 41 wins, and won his third and final Stanley Cup. He also won the Jennings Trophy for the third time, as well as his first Vezina Trophy, voted as the NHL’s most outstanding goaltender. Brodeur appeared in the NHL All-Star Game for the seventh time in his career. He was also named to the First All-Star Team for the first time in his career. 2003-04 In The Game Toronto Star #51 – Marty led the league with 38 wins. He won both the Vezina and Jennings Trophies, was named a starter in the 2004 NHL All-Star Game and voted a First Team All-Star. That summer, he would go undefeated in five games at the World Cup of Hockey Tournament, leading Canada to a championship. 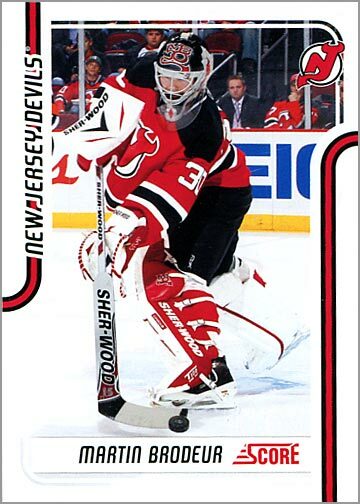 2006-07 Upper Deck #114 – Out of 82 regular season games, Brodeur played in 78. 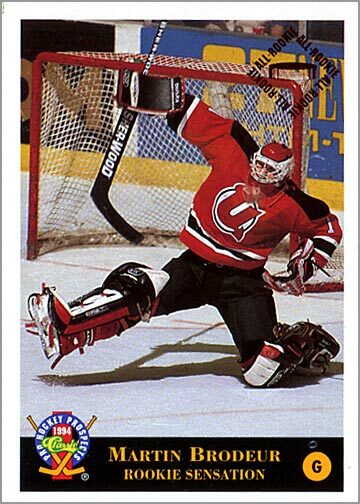 (Poor Scott Clemmensen, who was the only other Devils goalie that season, probably got splinters from sitting on the bench so much.) 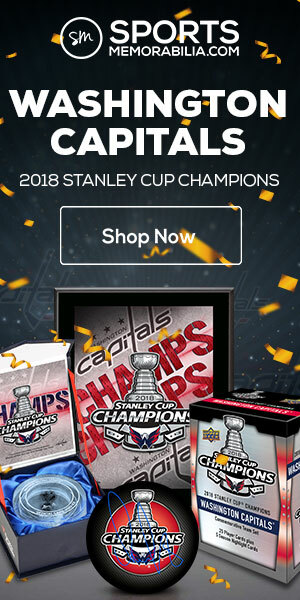 Bro-Dog led the league in wins with 48, made his final All-Star Game appearance, was named a First Team All-Star and won the Vezina Trophy for the third time. 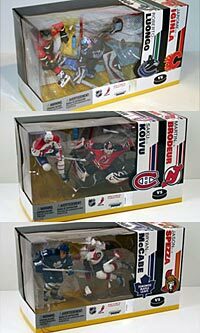 2007-08 SPx #85 – Brodeur won his fourth Vezina Trophy and was named to the Second All-Star Team for the fourth time. 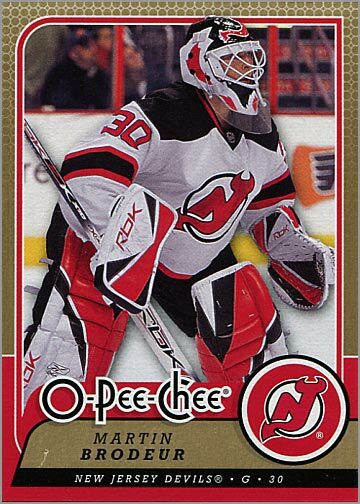 2008-09 O-Pee-Chee #227 – Brodeur gets his 552nd career win, setting a new record for regular season wins by a goalie. 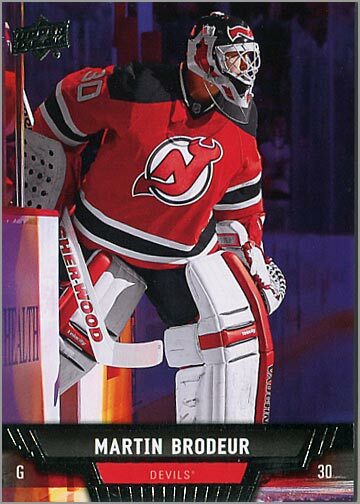 2009-10 Fleer Ultra #88 – Brodeur eclipses Terry Sawchuk’s record of 103 shutouts when he beats the Pittsburgh Penguins 4-0 on December 21, 2009 for his 104th career regular season shutout. He also breaks Patrick Roy’s record for minutes played and games played. Brodeur won his fifth and final Jennings Trophy. He won a second gold medal with Team Canada at the 2010 Olympic Games in Vancouver. 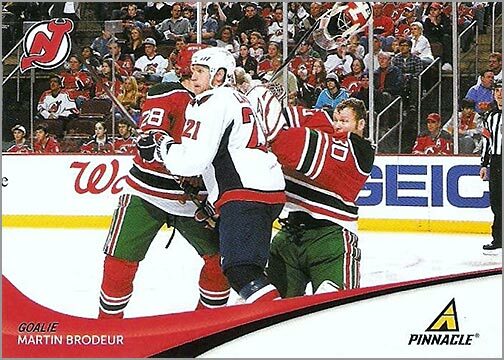 2010-11 Pinnacle #82 – At this point in his career, Brodeur is no longer winning trophies, but he is adding to his records for wins, shutouts, minutes played and games played. 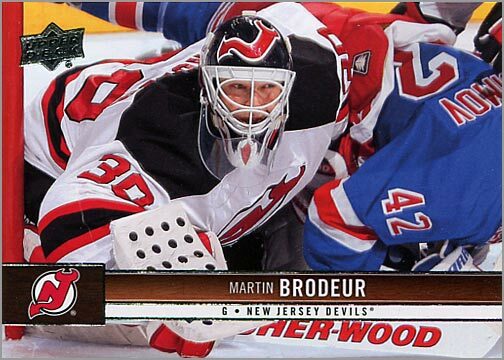 2011-12 Score #289 – Brodeur records his 24th playoff shutout, breaking Patrick Roy’s record. 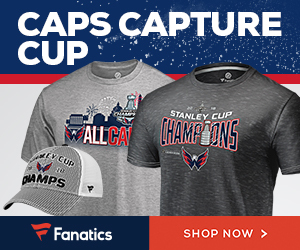 He also sets a playoff record for assists by a goalie with four assists. 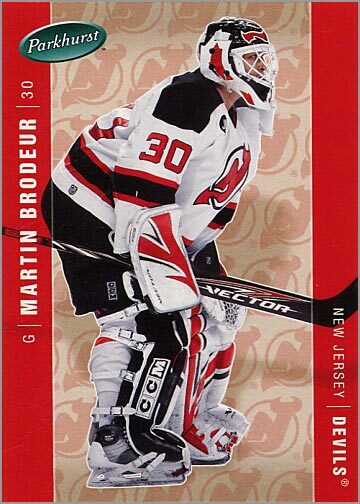 2012-13 Upper Deck #104 – Brodeur is credited with his third career goal when he is the last Devil to touch the puck before the Carolina Hurricanes score an own-goal with their goalie pulled. 2014-15 SPx #73 – This card won’t be officially released until next week. 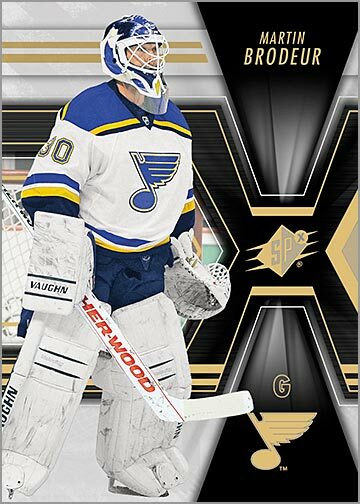 Upper Deck will include Brodeur in his St. Louis Blues jersey in their 2014-15 SPx Hockey set. They may include him in other sets, too. If not, there’s always these custom cards. 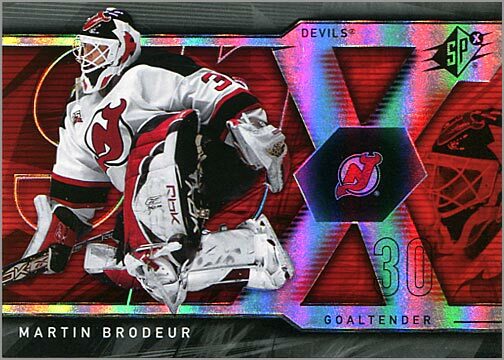 OVERTIME BONUS – Five oddball cards from Brodeur’s career. 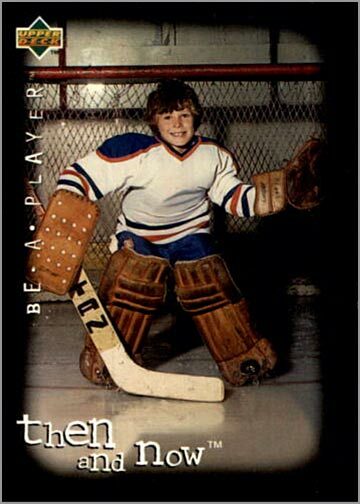 1994-95 Be A Player #R130 – Marty as a child, just barely old enough to reach the crossbar. 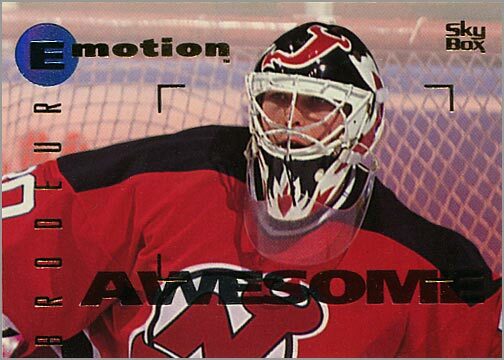 1995-96 Emotion #94 – Release the Awesome! 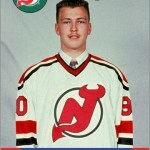 1998-99 Panini Stickers – …and here, Brodeur is just a floating head.